Vols. 1–3 consist of thirteen issues (9 and 10 were a double issue), three supplements, and one table of contents for vols. 1–4. Vol. 4 was published as an issue of the Canadian journal Open Letter (Fifth Series, no. 1, Winter 1982). Open Letter is edited by Frank Davey; the L=A=N=G=U=A=G=E issue was edited by Charles Bernstein and Bruce Andrews. The early to mid-1970s marked a rising ferment of experimental activity in the poetry world: the most extreme texts of the previous decade tumbling out, the coming (or returning) into print of earlier radical modernist works shaking up the apparent canon, the development of new preoccupations and modes of working that could not be contained within the mainstream or even within the available (and established) alternatives, and cross-pollinations with other art forms confronting similar problems and opportunities—all against a backdrop of political and social unsettling, at home and abroad. Face-to-face communities of aesthetically radicalized poets sprang up in the San Francisco Bay Area, New York, and Washington, D.C., where new reading series, presses, and magazines set the stage for intense discussions of new poetic possibilities as well as critical and historical thinking about poetry by the poets themselves (rather than by scholars or critics). Animated discussion of poetics went on in letters, in conversation, and in public talks, but there was no print forum for these ongoing exchanges. Announcement for the publication of L=A=N=G=U=A=G=E, ca. 1977. 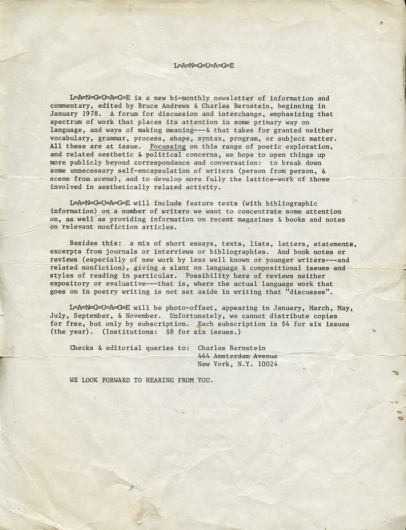 And so, in 1977, in consultation with Ron Silliman in California, we sketched out plans for a New York–based, self-produced magazine of information and commentary, L=A=N=G=U=A=G=E. The first issue appeared in February 1978 and went out to our initial subscribers—about 200 by the end of the first year—and was also distributed through a few bookstores. The first three volumes were typed on legal-size sheets on an IBM Selectric typewriter, sprayed to prevent smearing, and then pasted into our format by our designer, Susan Bee. The initial run was offset printed, although we often produced additional copies by photocopying. We stopped publishing the magazine in 1981, with our fourth volume, a perfect-bound book copublished with the Toronto magazine Open Letter. In 1984, Southern Illinois University Press published an anthology, The L=A=N=G=U=A=G=E Book, including about half of what we had published; this anthology was reissued by the press in 1997. Bruce Andrews, Charles Bernstein, Ray DiPalma, Steve McCaffery, and Ron Silliman, Legend (1980). Cover by Betsi Brandfass. Legend, collaborations by Bruce Andrews, Charles Bernstein, Ray DiPalma, Steve McCaffery, and Ron Silliman. 1980. Copublished with the Segue Foundation. Scans of the complete run of L=A=N=G=U=A=G=E are available on the Eclipse website.